62 / the tasting panel / october 2017 IN THE BIZ BREAKTHRU BEVERAGE COLORADO LIVES UP TO ITS NAME AT DENVER WAREHOUSE by Ruth Tobias S ometimes you have to build walls to break through them. Before bringing its employees—formerly housed in four separate buildings—together under one roof, Breakthru, Colorado's leading alcohol-beverage distributor, surveyed them for input on the design of its planned 647,500-square-foot facility in northeast Denver. The result? Much more room to interact. Breakthru's new home opened late this spring and boasts collabora- tive spaces at every turn, from a lobby filled with hoteling stations and lounge seating to the Alchemy Room, a test kitchen and bar equipped for educating—and entertain- ing—both in-house and on-premise staff. There's a myriad of conference, huddle, and training rooms, and some hallways even have window seats with outlets to facilitate impromptu meetings. For Vice President of Operations John Johnson, the open layout "gets us back to a real family group, and it's the communication between people that helps us build our company." Granted, a state-of-the-art warehouse helps spur growth, too: all 565,000 square feet of it, complete with separate temperature-controlled storage areas for keg beer and wine. "In the old space, we had to say no to prospective suppliers sometimes because we didn't have the capabilities," Executive Project Manager Brittany Murrow explains. Capacity has certainly increased, and the installation of high-speed conveyors and robotic shuttle systems, including one for holding returns, has drastically improved efficiency: Johnson says they "already see trucks loading earlier to get to our customers earlier" at around 6 a.m. versus 10 a.m. Meanwhile, his prediction that the new warehouse "will attract some suppliers too" has already proven true with the addition of brands like Melvin Brewing to the portfolio. The new facility "improved Breakthru's culture almost immediately" in other ways as well, Murrow notes. More natural light, plants and largescale landscapes by noted photographer John Fielder "bring the outside in," while a wellness center with curtained partitions offers privacy to resting or nursing employees. Sustainability initiatives include the use of recycled construction materials, as well as the install- ment of LED motion-sensor lighting that produced $11,000 in savings in just the first month of occupancy. 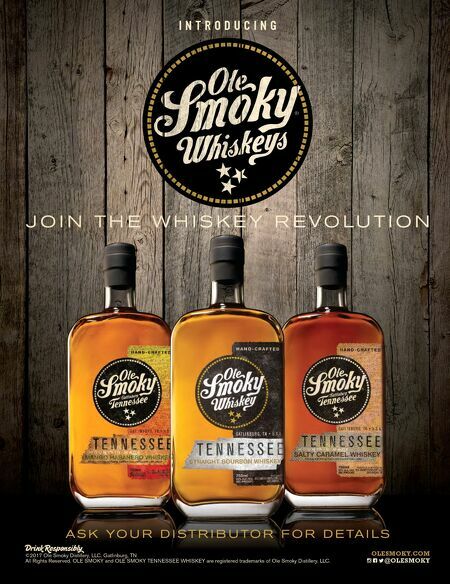 For this division of Breakthru—created just last year with the merger of the Charmer Sunbelt and Wirtz Beverage Groups—that alone portends a bright future. 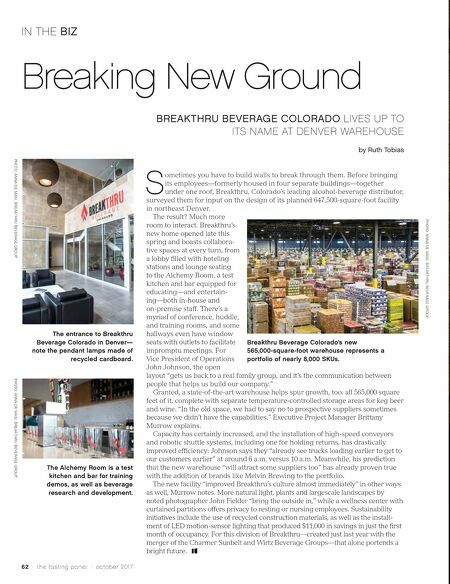 Breaking New Ground PHOTO: ANNA DE MASI, BREAKTHRU BEVERAGE GROUP PHOTO: ANNA DE MASI, BREAKTHRU BEVERAGE GROUP PHOTO: ANNA DE MASI, BREAKTHRU BEVERAGE GROUP Breakthru Beverage Colorado's new 565,000-square-foot warehouse represents a portfolio of nearly 8,000 SKUs. The entrance to Breakthru Beverage Colorado in Denver— note the pendant lamps made of recycled cardboard. The Alchemy Room is a test kitchen and bar for training demos, as well as beverage research and development.